Newfoundland and Labrador (, French: Terre-Neuve-et-Labrador; Innu: Akamassiss; Newfoundland Irish: Talamh an Éisc agus Labradar) is the most easterly province of Canada. 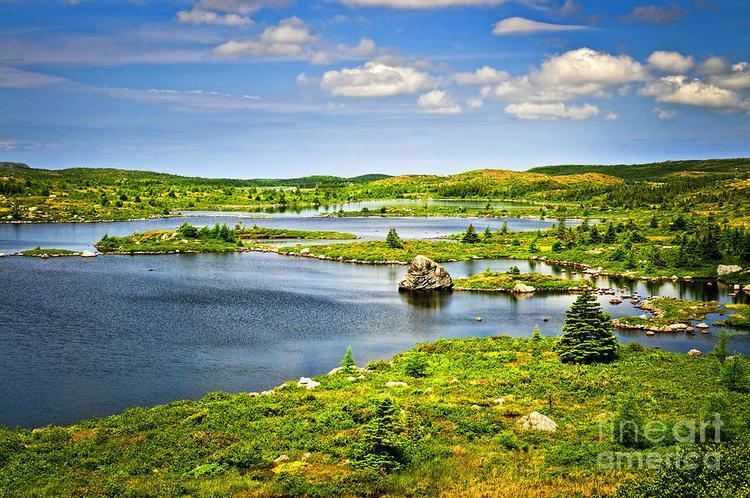 Situated in the country's Atlantic region, it comprises the island of Newfoundland and mainland Labrador to the northwest, with a combined area of 405,212 square kilometres (156,500 sq mi). In 2013, the province's population was estimated at 526,702. About 92% of the province's population lives on the island of Newfoundland (and its neighbouring smaller islands), of whom more than half live on the Avalon Peninsula. The province is Canada's most linguistically homogeneous, with 97.6% of residents reporting English (Newfoundland English) as their mother tongue in the 2006 census. 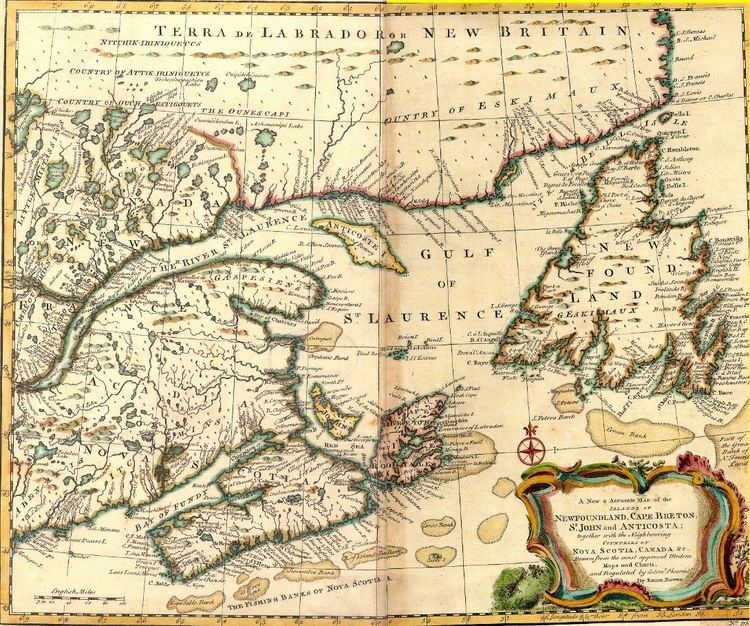 Historically, Newfoundland was also home to unique varieties of French and Irish, as well as the extinct Beothuk language. In Labrador, local dialects of Innu-aimun and Inuktitut are also spoken. A former colony and then dominion of the United Kingdom, Newfoundland gave up its independence in 1933, following significant economic distress caused by the Great Depression and the aftermath of Newfoundland's participation in World War I. It became the tenth province to enter the Canadian Confederation on March 31, 1949, as "Newfoundland." On December 6, 2001, an amendment was made to the Constitution of Canada to change the province's official name to Newfoundland and Labrador. 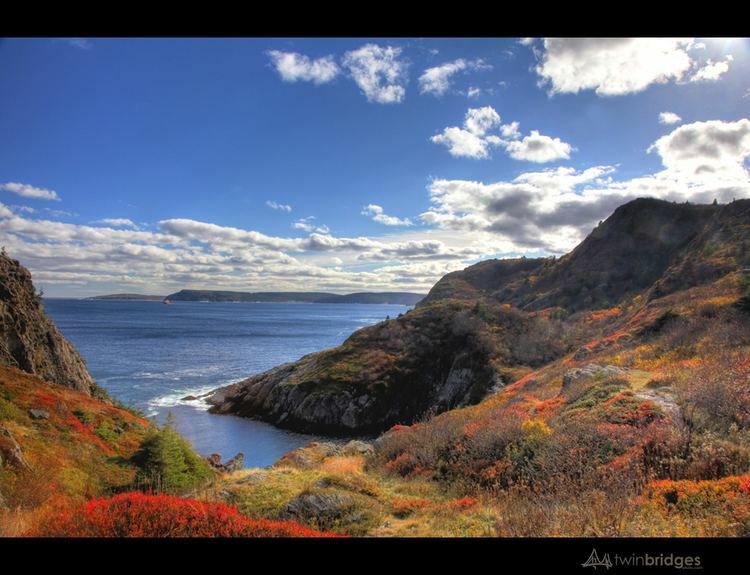 The name "Newfoundland" is a translation of the Portuguese Terra Nova, that is also reflected in the French name for the Province's island part (Terre-Neuve). The influence of early Portuguese exploration is also reflected in the name of Labrador, which derives from the surname of the Portuguese navigator João Fernandes Lavrador. Newfoundland and Labrador is the most easterly province in Canada, and is located at the north-eastern corner of North America. The Strait of Belle Isle separates the province into two geographical divisions: Labrador, which is a large area of mainland Canada, and Newfoundland, an island in the Atlantic Ocean. The province also includes over 7,000 tiny islands. Newfoundland is roughly triangular. Each side is about 400 km (250 mi) long, and its area is 108,860 km2 (42,030 sq mi). Newfoundland and its neighboring small islands (excluding French possessions) have a total area of 111,390 km2 (43,010 sq mi). Newfoundland extends between latitudes 46°36′N and 51°38′N. Labrador is an irregular shape: the western part of its border with Quebec is the drainage divide of the Labrador Peninsula. Lands drained by rivers that flow into the Atlantic Ocean are part of Labrador, the rest belongs to Quebec. Most of Labrador's southern boundary with Quebec follows the 52nd parallel of latitude. Labrador's extreme northern tip, at 60°22′N, shares a short border with Nunavut. Labrador's area (including associated small islands) is 294,330 km2 (113,640 sq mi). Together, Newfoundland and Labrador make up 4.06% of Canada's area. Monthly average temperatures, rainfall and snowfall for four places are shown in the attached graphs. St. John's represents the east coast, Gander the interior of the island, Corner Brook the west coast of the island and Wabush the interior of Labrador. Climate data for 56 places in the province is available from Environment Canada. The data for the graphs is the average over thirty years. Error bars on the temperature graph indicate the range of daytime highs and night time lows. Snowfall is the total amount that fell during the month, not the amount accumulated on the ground. This distinction is particularly important for St. John's, where a heavy snowfall can be followed by rain, so that no snow remains on the ground. The Maritime Archaic peoples were gradually displaced by people of the Dorset Culture (Late Paleo-Eskimo) who also occupied Port au Choix. The number of their sites discovered on Newfoundland indicates they may have been the most numerous group of Aboriginal people to live there. They thrived from about 2000 BC to AD 800. Many of their sites were located on exposed headlands and outer islands. They were more oriented to the sea than earlier peoples, and had developed sleds and boats similar to kayaks. They burned seal blubber in soapstone lamps. The people of the Dorset Culture (800 BC – AD 1500) were highly adapted to living in a very cold climate, and much of their food came from hunting sea mammals through holes in the ice. The massive decline in sea ice during the Medieval Warm Period would have had a devastating impact upon their way of life. The appearance of the Beothuk culture is believed to be the most recent cultural manifestation of peoples who first migrated from Labrador to Newfoundland around 1 AD. The Inuit, found mostly in Labrador, are the descendants of what anthropologists call the Thule people, who emerged from western Alaska around AD 1000 and spread eastwards across the High Arctic, reaching Labrador around 1300–1500. Researchers believe that the Dorset culture lacked the dogs, larger weapons and other technologies that gave the expanding Inuit people an advantage. Over time, groups started to focus on resources available to them locally. The inhabitants eventually organized themselves into small bands of a few families, grouped into larger tribes and chieftainships. The Innu are the inhabitants of an area they refer to as Nitassinan, i.e. most of what is now referred to as northeastern Quebec and Labrador. Their subsistence activities were historically centred on hunting and trapping caribou, deer and small game. Coastal clans also practised agriculture, fished and managed maple sugar bush. The Innu engaged in tribal warfare along the coast of Labrador with the Inuit groups that had significant populations. By the time that European contact with Newfoundland began in the early 16th century, the Beothuk were the only indigenous group living permanently on the island. Unlike other groups in the Northeastern area of the Americas, the Beothuk never established sustained trading relations with European settlers. Instead, their trading interactions were sporadic, and they largely attempted to avoid contact in order to preserve their culture. The establishment of English fishing operations on the outer coastline of the island, and their later expansion into bays and inlets, cut off access for the Beothuk to their traditional sources of food. In the 18th century, as the Beothuk were driven further inland by these encroachments, violence between Beothuk and settlers escalated, with each retaliating against the other in their competition for resources. By the early 19th century, violence, starvation, and exposure to tuberculosis had decimated the Beothuk population, and they were extinct as a cultural group by 1829. Geneticists have suggested that some Icelanders may carry Beothuk DNA, which has been passed down matrilineally over the centuries. This suggests that when the Vikings abandoned their colonization of Newfoundland around 1000 AD, they might have brought back Beothuk women to Europe. The oldest confirmed accounts of European contact date from a thousand years ago as described in the Viking (Norse) Icelandic Sagas. Around the year 1001, the sagas refer to Leif Ericson landing in three places to the west, the first two being Helluland (possibly Baffin Island) and Markland (possibly Labrador). Leif's third landing was at a place he called Vinland (possibly Newfoundland). Archaeological evidence of a Norse settlement was found in L'Anse aux Meadows, Newfoundland, which was declared a World Heritage site by UNESCO in 1978. There are several other unconfirmed accounts of European discovery and exploration, one tale by men from the Channel Islands being blown off course in the late 15th century into a strange land full of fish, and another from Portuguese maps that depict the Terra do Bacalhau, or land of codfish, west of the Azores. The earliest, though, is the Voyage of Saint Brendan, the fantastical account of an Irish monk who made a sea voyage in the early 6th century. While the story itself became a part of myth and legend, some historians believe it is based on fact. In 1496 John Cabot obtained a charter from English King Henry VII to "sail to all parts, countries and seas of the East, the West and of the North, under our banner and ensign and to set up our banner on any new-found-land" and on June 24, 1497, landed in Cape Bonavista. Historians disagree on whether Cabot landed in Nova Scotia in 1497 or in Newfoundland, or possibly Maine, if he landed at all, but Bonavista is recognised by the governments of Canada and the United Kingdom as being Cabot's "official" landing place. In 1499 and 1500, Portuguese mariners João Fernandes Lavrador and Pêro de Barcelos explored and mapped the coast, the former's name appearing as "Labrador" on topographical maps of the period. Based on the Treaty of Tordesillas, the Portuguese Crown claimed it had territorial rights in the area visited by John Cabot in 1497 and 1498. Subsequently, in 1501 and 1502 the Corte-Real brothers, Miguel and Gaspar, explored Newfoundland and Labrador, claiming them as part of the Portuguese Empire. In 1506, king Manuel I of Portugal created taxes for the cod fisheries in Newfoundland waters. João Álvares Fagundes and Pêro de Barcelos established seasonal fishing outposts in Newfoundland and Nova Scotia around 1521, and older Portuguese settlements may have existed. Sir Humphrey Gilbert, provided with letters patent from Queen Elizabeth I, landed in St John's in August 1583, and formally took possession of the island. Sometime before 1563 Basque fishermen, who had been fishing cod shoals off Newfoundland's coasts since the beginning of the sixteenth century, founded Plaisance (today Placentia), a seasonal haven which French fishermen later also used. In the Newfoundland will, now in an archive in Spain, of the Basque seaman Domingo de Luca dated 1563 de Luca asks “that my body be buried in this port of Plazençia in the place where those who die here are usually buried.” This will is the oldest known civil document written in Canada. Twenty years later in 1583 Newfoundland became England's first possession in North America and one of the earliest permanent English colonies in the New World when Sir Humphrey Gilbert claimed it for Queen Elizabeth. Though English fishing boats had visited Newfoundland continuously since Cabot's second voyage in 1498 and seasonal fishing camps had existed for a century prior, the Basque, French, and Portuguese had done likewise. In 1585, however, this changed: Bernard Drake led a devastating raid on the Spanish and Portuguese fisheries from which they never recovered. This provided an opportunity to secure the island and led to the appointment of Proprietary Governors to establish colonial settlements on the island from 1610 to 1728. John Guy became governor of the first settlement at Cuper's Cove. Other settlements included Bristol's Hope, Renews, New Cambriol, South Falkland and Avalon (which became a province in 1623). The first governor given jurisdiction over all of Newfoundland was Sir David Kirke in 1638. Explorers early realized that the waters around Newfoundland had the best fishing in the North Atlantic. By 1620, 300 fishing boats worked the Grand Banks, employing some 10,000 sailors; many continuing to come from the Basque Country, Normandy, or Brittany. They dried and salted cod on the coast and sold it to Spain and Portugal. Heavy investment by Sir George Calvert, 1st Baron Baltimore, in the 1620s in wharves, warehouses, and fishing stations failed to pay off. French raids hurt the business, and the weather was terrible, so he redirected his attention to his other colony in Maryland. After Calvert left, small-scale entrepreneurs such as Sir David Kirke made good use of the facilities. Kirke became the first governor of Newfoundland in 1638. A triangular trade with New England, the West Indies, and Europe gave Newfoundland an important economic role. By the 1670s there were 1700 permanent residents and another 4500 in the summer months. In the Treaty of Utrecht (1713), France had acknowledged British ownership of the island. 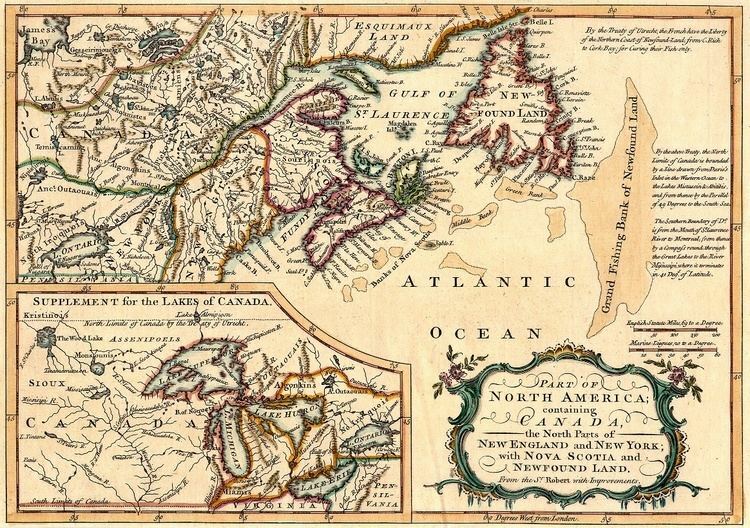 However, in the Seven Years' War (1756–1763), control of Newfoundland once again became a major source of conflict between Britain, France and Spain who all pressed for a share in the valuable fishery there. Britain's victories around the globe led William Pitt to insist that nobody other than Britain should have access to Newfoundland. 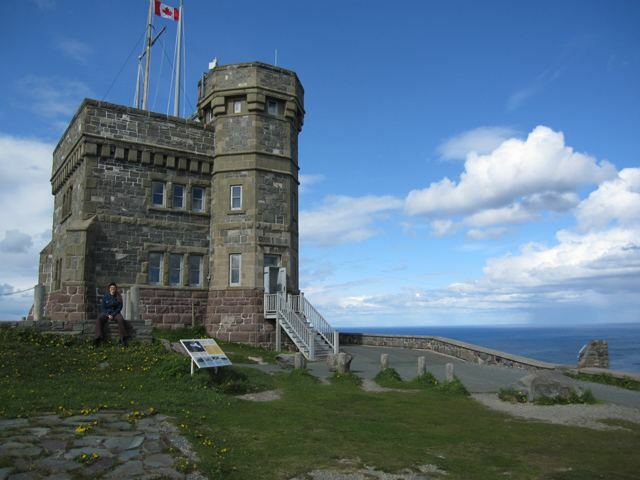 The Battle of Signal Hill took place in Newfoundland in 1762 when a French force landed and tried to occupy the island, only to be repulsed by the British. From 1763 to 1767 James Cook made a detailed survey of the coasts of Newfoundland and southern Labrador while commander of the HMS Grenville. (The following year, 1768, Cook began his first circumnavigation of the world.) In 1796 a Franco-Spanish expedition again succeeded in raiding the coasts of Newfoundland and Labrador, destroying many of the settlements. Newfoundland's own regiment, the 1st Newfoundland Regiment, fought in the First World War. On July 1, 1916, nearly the entire regiment was wiped out at Beaumont Hamel on the first day on the Somme. The regiment went on to serve with distinction in several subsequent battles, earning the prefix "Royal". Despite people's pride in the accomplishments of the regiment, the Dominion's war debt due to the regiment and the cost of maintaining a trans-island railway led to increased and ultimately unsustainable government debt in the post-war era. Since the early 1800s, Newfoundland and Quebec (or Lower Canada) had been in a border dispute over the Labrador region. In 1927, however, the British government ruled that the area known as modern day Labrador was to be considered part of the Dominion of Newfoundland. Due to Newfoundland's high debt load, arising from World War I and construction of the Newfoundland Railway, and decreasing revenue, due to the collapse of fish prices, the Newfoundland legislature voted itself out of existence in 1933, in exchange for loan guarantees by the Crown and a promise it would be re-established. On February 16, 1934, the Commission of Government was sworn in, ending 79 years of responsible government. The Commission consisted of seven persons appointed by the British government. For 15 years no elections took place, and no legislature was convened. When prosperity returned with World War II, agitation began to end the Commission, and reinstate responsible government. But, the British government created the National Convention in 1946, reflecting efforts in self-determination among European nationalities that followed WWII. The Convention, made up of representatives from throughout the country, was formally tasked to advise on the future of Newfoundland. Chaired by Judge Cyril J. Fox, it consisted of 45 elected members from across the province. Several motions were made by Joey Smallwood (a member of the convention who later served as the first premier of Newfoundland) to examine joining Canada by sending a delegation to Ottawa. The first motion was defeated, although the Convention later decided to send delegations to both London and Ottawa to explore alternatives. In January 1948, the National Convention voted against putting Confederation onto the referendum 29 to 16; but, this vote was over-ruled by the British, which controlled the National Convention and the subsequent referendum. Those who supported Confederation were extremely disappointed with the recommendations of the National Convention and organized a petition which more than 50,000 Newfoundlanders signed demanding that Confederation with Canada be placed before the people in the upcoming referendum. As most historians agree, the British government keenly wanted Confederation on the ballot and they made sure that it was. Three main factions actively campaigned during the leadup to the referendums. Smallwood led the Confederate Association (CA), advocating union with the Canadian Confederation. They campaigned through a newspaper known as The Confederate. The Responsible Government League (RGL), led by Peter Cashin, advocated an independent Newfoundland with a return to responsible government. Their newspaper was The Independent. A third, smaller Economic Union Party (EUP), led by Chesley Crosbie, advocated closer economic ties with the United States. Though a 1947 poll found 80% of Newfoundland residents wanting to become Americans, the EUP failed to gain much attention, and merged with the RGL after the first referendum. The first referendum took place on June 3, 1948; 44.6% of people voted for responsible government, 41.1% voted for confederation with Canada, while 14.3% voted for Commission of Government. Since none of the choices had gained over 50%, a second referendum with only the two more popular choices was held on July 22, 1948. The official outcome of that referendum was 52.3% for confederation with Canada and 47.7% for responsible (independent) government. After the referendum, a seven-man delegation was picked by the British governor to negotiate Canada's offer on behalf of Newfoundland. After six of the seven-man delegation signed, the British Government passed the British North America Act, 1949 through Parliament. Newfoundland officially joined Canada at midnight, March 31, 1949. As documents in British and Canadian archives came available in the 1980s, it became clear that both Canada and the United Kingdom wanted Newfoundland to join Canada. Some have charged that it was a conspiracy to manoeuvre Newfoundland into Confederation, in exchange for forgiveness of Britain's war debt and for other considerations, but most historians who have examined the government documents have concluded that while Britain engineered the inclusion of Confederation in the referendum, Newfoundlanders made the final decision themselves although it was a close vote. Subsequent to the referendum, there had been hearsay that the referendum was narrowly won by the responsible government side, but the result was fixed by the British governor. Shortly after the referendum, several boxes of ballots from St. John's were burned by order of Herman William Quinton, one of only two commissioners who supported confederation. Some have argued that independent oversight of the vote tallying was lacking but the process was supervised by respected Corner Brook Magistrate Nehemiah Short who had also overseen elections to the National Convention. A 1976 article reported that the tricolour flag was created in 1843 by then Roman Catholic Bishop of Newfoundland, Michael Anthony Fleming. The colours were intended to represent the symbolic union of Newfoundland's historically dominant ethnic/religious groups: English, Scots and Irish. Though popular, there is no historical evidence to support this legend. At the same time, many of the province's Catholics, approximately 37% of the total population (with at least 22% of the population claiming Irish ancestry), think that the current provincial flag does not satisfactorily represent them. But, a government-sponsored poll in 2005 revealed that 75% of Newfoundlanders rejected adoption of the Tricolour flag as the province's official flag. The largest single religious denomination by number of adherents according to the 2011 National Household Survey was the Roman Catholic Church, at 35.8% of the province's population (181,590 members). The major Protestant denominations made up 57.3% of the population, with the largest groups being the Anglican Church of Canada at 25.1% of the total population (127,255 members), the United Church of Canada at 15.5% (78,380 members), and the Pentecostal churches at 6.5% (33,195 members), with other Protestant denominations in much smaller numbers. Non-Christians constituted only 6.8% of the population, with the majority of those respondents indicating "no religious affiliation" (6.2% of the total population). The fishing industry remains an important part of the provincial economy, employing roughly 20,000 and contributing over $440 million to the GDP. The combined harvest of fish such as cod, haddock, halibut, herring and mackerel was 150,000 tonnes (165,000 tons) valued at about $130 million in 2006. Shellfish, such as crab, shrimp and clams, accounted for 195,000 tonnes (215,000 tons) with a value of $316 million in the same year. The value of products from the seal hunt was $55 million. Aquaculture is a new industry for the province, which in 2006 produced over 10,000 tonnes of Atlantic salmon, mussels and steelhead trout worth over $50 million. Newfoundland and Labrador is governed by a parliamentary government within the construct of constitutional monarchy; the monarchy in Newfoundland and Labrador is the foundation of the executive, legislative, and judicial branches. The sovereign is Queen Elizabeth II, who also serves as head of state of 15 other Commonwealth countries, each of Canada's nine other provinces and the Canadian federal realm; she resides in the United Kingdom. The Queen's representative in Newfoundland and Labrador is the Lieutenant Governor of Newfoundland and Labrador, presently Frank Fagan. Before 1950, the formal visual arts were a minor aspect of Newfoundland cultural life, compared to the performing arts such as music or theatre. Until about 1900, most art was the work of visiting artists, who included members of the Group of Seven, Rockwell Kent, and Eliot O'Hara. Artists such as Newfoundland-born Maurice Cullen and Robert Pilot traveled to Europe to study art in prominent ateliers. Margaret Duley (1894–1968) was arguably Newfoundland's first novelist to gain an international audience. Amongst her works are The Eyes of the Gull (1936), Cold Pastoral (1939} and Highway to Valour (1941). Subsequent important novelists include Harold Horwood, who wrote Tomorrow Will Be Sunday (1966) and White Eskimo (1972), and Percy Janes, author of House of Hate (1970). Crummey's debut novel, River Thieves (2001), became a Canadian bestseller and won the Thomas Head Raddall Award, the Winterset Award for Excellence in Newfoundland Writing, and the Atlantic Independent Booksellers' Choice Award. It was also shortlisted for the Giller Prize, the Commonwealth Writers' Prize, and the Books in Canada First Novel Award, as well as being longlisted for the IMPAC Award. His second novel, The Wreckage (2005), was longlisted for the 2007 IMPAC Award, and his third novel, Galore (2009), was shortlisted for the 2011 IMPAC Award. Johnston's fiction deals primarily with the province of Newfoundland and Labrador, often in a historical setting. His first novel, The Story of Bobby O'Malley, brought him early critical notice and won the W.H. Smith/Books in Canada First Novel Award in 1985. His second novel, The Time of Their Lives, won the Air Canada/Canadian Authors Association Award for Most Promising Young Canadian Writer in 1988. His novel The Divine Ryans won the 1991 Thomas Head Raddall Award and was subsequently adapted for the screen. His breakthrough novel, 1998's The Colony of Unrequited Dreams – shortlisted for both the Giller Prize and the Governor General's Award for fiction – was acclaimed for its historical portrayal of legendary Newfoundland politician Joey Smallwood. It was featured on the cover of the New York Times Book Review when it was released in the United States, and was an international best seller. The Colony of Unrequited Dreams won or was nominated for sixteen national and international awards. In 2002, Johnston published The Navigator of New York, which was shortlisted for both the Giller Prize and the Governor General's Award for fiction. Johnston was awarded the Writers' Trust Engel/Findley Award in recognition of his contribution to Canadian Literature in 2011. Several of Johnston's books have been published in the United States, the United Kingdom, the Netherlands, Germany and China. Harvey is a novelist whose books are published throughout the world. Amongst these are The Town That Forgot How to Breathe (2003), which won the 2004 Thomas Head Raddall Award and Italy's Libro del Mare), Inside (2006), long listed for the Giller Prize), winner of the Rogers Writers' Trust Fiction Prize, and the Winterset Award, and Blackstrap Hawco (2008), which was longlisted for the Giller Prize), and shortlisted for the Commonwealth Writers Prize. After World War II, Newfoundland poet E. J. Pratt described the struggle to make a living from the sea in poems about maritime life and the history of Canada. In 1923, his first commercial poetry collection, Newfoundland Verse, was released. It is frequently archaic in diction, and reflects a pietistic and late-Romantic lyrical sensibility. The collection has humorous and sympathetic portraits of Newfoundland characters, and creates an elegiac mood in poems concerning sea tragedies or Great War losses. With illustrations by Group of Seven member Frederick Varley, Newfoundland Verse proved to be Pratt's "breakthrough collection." He went on to publish 18 more books of poetry in his lifetime. "Recognition came with the narrative poems The Witches’ Brew (1925), Titans (1926), and The Roosevelt and the Antinoe (1930), and though he published a substantial body of lyric verse, it is as a narrative poet that Pratt is remembered." Pratt's poetry "frequently reflects his Newfoundland background, though specific references to it appear in relatively few poems, mostly in Newfoundland Verse," says The Canadian Encyclopedia. "But the sea and maritime life are central to many of his poems, for example, "The Cachalot" (1926), which describes duels between a whale and its foes, a giant squid and a whaling ship and crew. Newfoundland English is any of several accents and dialects of English found in the province of Newfoundland and Labrador. Most of these differ substantially from the English commonly spoken elsewhere in neighbouring Canada and the North Atlantic. Many Newfoundland dialects are similar to the West Country dialects of the West Country in England, particularly the city of Bristol and counties Cornwall, Devon, Dorset, Hampshire and Somerset, while others resemble dialects of Ireland's southeast, particularly Waterford, Wexford, Kilkenny and Cork. Still others blend elements of both, and there is also a Scottish influence on the dialects. While the Scots came in smaller numbers than the English and Irish, they had a large influence on Newfoundland society. Newfoundland and Labrador has a somewhat different sports culture from the rest of Canada, owing in part to its long history separate from the rest of Canada and under British rule. Ice hockey, however, remains popular; the St. John's IceCaps play professionally at the Mile One Centre in St. John's, and the Newfoundland Senior Hockey League has teams around the island. Since the departure of the St. John's Fog Devils in 2008, Newfoundland and Labrador is the only province in Canada to not have a team in the Canadian Hockey League (should one ever join it would be placed in the QMJHL, which hosted the Fog Devils and has jurisdiction over Atlantic Canada). Gridiron football, be it either American or Canadian, is almost nonexistent; it is the only Canadian province other than Prince Edward Island to have never hosted a Canadian Football League or Canadian Interuniversity Sport game, and it was not until 2013 that the province saw its first amateur teams form. Cricket was once a popular sport. The earliest mention is in the Newfoundland Mercantile Journal, Thursday September 16, 1824, indicating that the St. John’s Cricket Club was an established club at this time. The St. John’s Cricket club was one of the first cricket clubs in North America. Other centres were at Harbour Grace, Twillingate, and Trinity. The heyday of the game was the late nineteenth and early twentieth century, at which time there was league in St. John’s, as well as an interschool tournament. John Shannon Munn is Newfoundland's most famous cricketer, having represented Oxford University. After the first World War, cricket declined in popularity and was replaced by soccer and baseball. A regular passenger and car ferry service, lasting about 90 minutes, crosses the Strait of Belle Isle, connecting the province's island of Newfoundland with the region of Labrador on the mainland. The ferry MV Apollo travels from St. Barbe, Newfoundland on the Great Northern Peninsula to the port town of Blanc-Sablon, Quebec, located on the provincial border and beside the town of L'Anse-au-Clair, Labrador. The MV Sir Robert Bond once provided seasonal ferry service between Lewisporte on the island and the towns of Cartwright and Happy Valley-Goose Bay in Labrador, but has not run since the completion of the Trans Labrador highway in 2010, allowing access from Blanc-Sablon, Quebec to major parts of Labrador. Several smaller ferries connect numerous other coastal towns and offshore island communities around the island of Newfoundland and up the Labrador coast as far north as Nain. Inter-provincial ferry services are provided by Marine Atlantic, a federal Crown corporation which operates auto-passenger ferries from North Sydney, Nova Scotia to the towns of Port aux Basques and Argentia on the southern coast of Newfoundland island.